Firewatchers Everett Arthur Oatley (17) and Edward Arthur Riddell (18) were young brothers by adoption who were killed together by enemy action on 24 April 1941. Occasionally when researching these personal histories I find something that pulls at the heart strings, and none more so than this tale of two young men, barely more than boys, who were tragically taken from life too soon and so cruelly in addition to the lives of two courageous wardens who with no thought for their own safety headed into the danger to save lives. Edward Arthur Riddell was born on 16 October 1922. His mother was Eva Jessie Spencer who married Royal Marine William Thomas Riddell on 3 October 1910. Although Edward was the third of four children of Eva's who carried the Riddell surname, the man from who they inherited that name passed away at the Royal Naval Hospital in Haslar on 14 June 1912 long before any of the children were born. 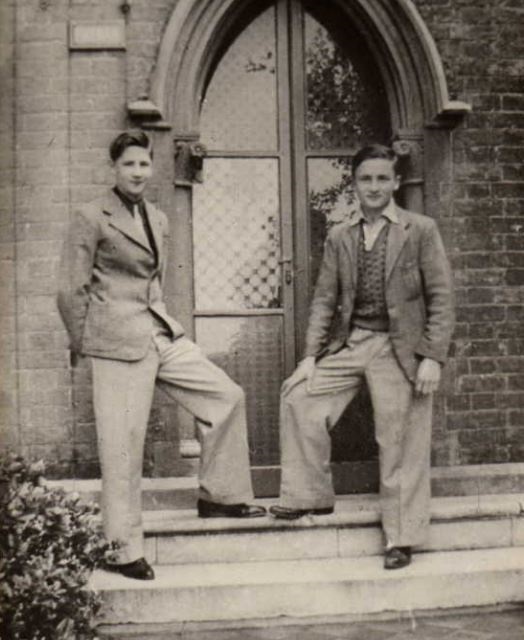 No record has been found of Edward's real father or that of his eldest brother Wallace (1915), elder sister Dorothy May (1919) or his closest brother Jack (1920). Wallace was born in Portsmouth, the other three in Cowes from where Eva originated. 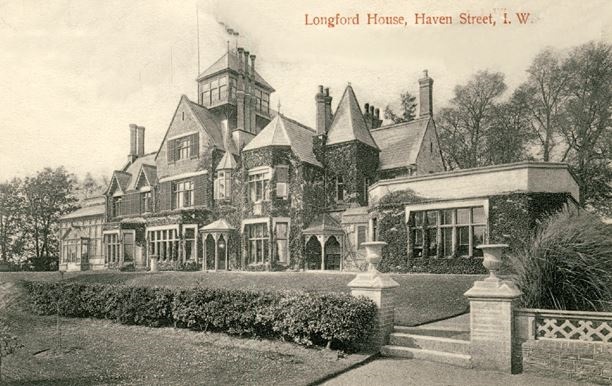 On 13 October 1926 Edward's mother Eva passed away at Longford House, Havenstreet, presumably of tuberculosis as the house was adapted as a hospital for this purpose. Exactly what happened to Edward and his siblings in the immediate aftermath isn't known although a record has been located that indicates Wallace later received a Distinguished Service Medal for his action at Dunkirk. Longford House tuberculosis sanatorium, Havenstreet. Everett Arthur Oatley was born on 17 October 1923 in West Derby, Lancashire. His parents were Elsie and Frederick Arthur who worked full-time as a gas fitter. The couple had married in Toxteth Park, Lancashire, in July 1921 although both were born in East Cowes in 1895 and 1896 respectively. Why they were in Lancashire and when and why they returned to the Island isn't known but it is known that by 1933 Frederick's name had begun to appear in local newspaper reports regarding the activities of East Cowes Fire Brigade in which he was a fireman. Ironically researching Edward Arthur Riddell's family background has been more fruitful than that of Everett Arthur Oatley; the irony being in the fact that at some stage the Oatley's adopted the parentless Edward but he kept the Riddell surname. Normally one would expect to meet more brick walls when investigating the roots of the adopted person, which I know from personal experience. Edward Arthur Riddell on the right, the identity of the boy on the left is unproven. In 1934 the boy's father Frederick competed in the motor-pump competition for the East Cowes brigade at the IWFBF competition held in the grounds of the Frank James Hospital. By 1940 a County Press report of a social occasion held in Newport noted that Frederick sung a series of amusing songs and that he was by now a member of the Auxiliary Fire Service rather than the regular brigade. However this is contradicted entirely in the 1939 Register which states he was a member of Cowes Fire Brigade (by then the two towns had been politically combined into one urban district council under the title Cowes and often no distinction was made between the brigades on either side of the Medina as they came under the same chief officer Mr T.J. Upward). The same Register showed that Everett and Edward were now apprenticed, the former as a toolmaker and the latter as a joiner. No doubt the hubbub of war and the example set by Frederick's firefighting inspired the boys to volunteer as East Cowes firewatchers. The idea had been raised in January 1941 by Chief Officer Upward and whilst the Urban District's councillors were horrified at the idea of the expense, it was soon proven that a strong assembly of volunteers were willing to take on this vital role; the two teenage boys among them. Chief Officer Wilfred Brown of Sandown Fire Brigade noted in his diary of 24 April 1941; RED 21:33 White 23:18 - until this alert came along, from 2pm all had been quiet. During the raid incendiary bombs were dropped along the centre of the Island from Dunnose Point into Parkhurst Forest which was set alight. The 26 April edition of the County Press elaborated further; Thousands of incendiary bombs were showered over a wide area, causing three serious fires. A number of high explosive bombs were afterwards dropped in and near two towns causing some casualties. The editorial referred to some significant losses from fire before returning to the matter of casualties; Loss of life occurred when a villa in a seaside resort received a direct hit from a high explosive bomb. There were four occupants in the detached house, which is the residence of Mr and Mrs F.A. Oatley, and the bomb completely demolished the rear portion of it. Those at home at the time were Mrs Oatley, Mrs Kings (her mother, aged 86), Mr Everett Oatley and and Mr Edward Riddell (an adopted son). When the rescue party arrived they soon found Mrs Kings, who was crouched down by a table, and she was extricated from the debris. It, however, took about an hour to get Mrs Oatley out, as she was pinned down by a sideboard. Both were taken to hospital suffering from slight injuries. The fact that they were rescued so quickly reflects great credit on the members of the rescue party, who did not hesitate in entering the ruins, which might have collapsed at any moment. At the time the bomb fell two A.R.P. wardens, Messrs. M. Brinton and Cowburn, who were near at hand, immediately dashed to the back of the house, and as nothing has been seen or heard of them since it is feared that they probably fell into the bomb crater and were buried by the collapsing walls. The rescue party, members of the first-aid party, wardens, and others worked throughout the night in an endeavour to find the two buried youths and the two missing wardens. After about three hours they succeeded in finding Everett Oatley, but he was dead. Yesterday (Friday) morning they were still excavating in and around the bomb crater in search of Edward Riddell and the two wardens. The two A.R.P. Wardens that ploughed into the ruins with thoughts only to save the lives of those inside were William Marchant Cowburn and Montague Bernard Brook Brinton. 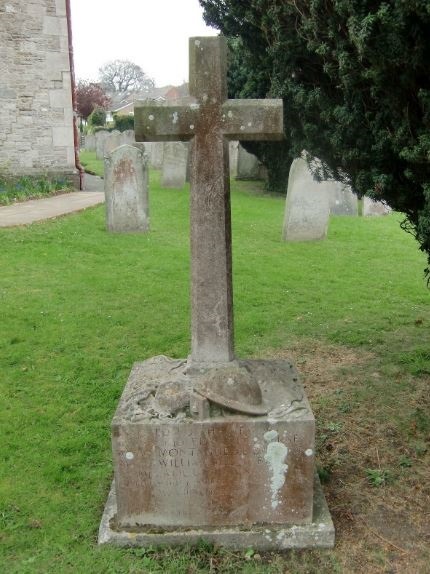 William was a 37 year old who resided at Gippeswyk, Old Road, East Cowes. He was born in Doncaster in 1903 and married Ethel May. At the time of his death the County Press stated that he lived as single man with his widowed mother and was employed at J.S. White's Somerton Works. Montague was also 37 and lived at Thurston in the same road where he met his death, with his wife Margaret who he married in 1938 and their baby daughter Anita. Montague and Margaret had married on the Island but the 1939 Register recorded the couple living in Portsmouth High Street. At the time Montague worked as a boatbuilder/shipwright for Messrs. Vosper Ltd., and in his spare time served as a special constable. While working for Vospers Montague had been closely associated with Sir Malcolm Campbell and involved with his record breaking bids in Bluebird II at Coniston Water and Geneva. Sir Malcolm penned a letter of condolence to Montague's family on hearing of his death. Montague and Margaret had moved to the Island a short while before the incident at The Limes following the destruction of their Portsmouth home during one of the heavy raids sustained by the city. Once on the Island Montague resumed his trade with Groves and Guttridge. East Cowes A.R.P. Memorial, featuring the names of Cowburn, Brinton and several others. 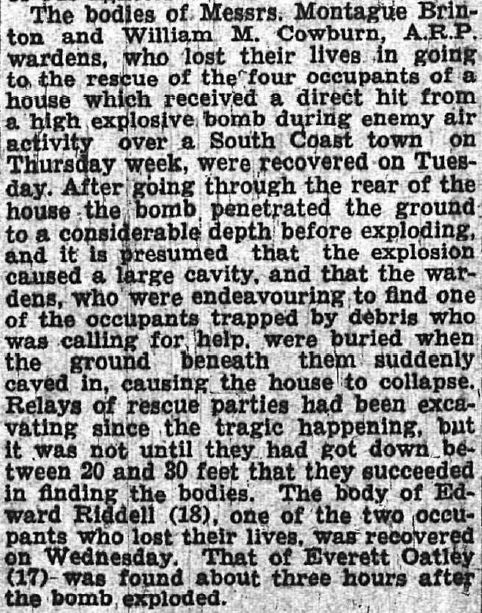 The bodies of Riddell, Cowburn and Brinton were finally located and removed from the ruins of the family home that had been The Limes (see the copied extract from the County Press below). 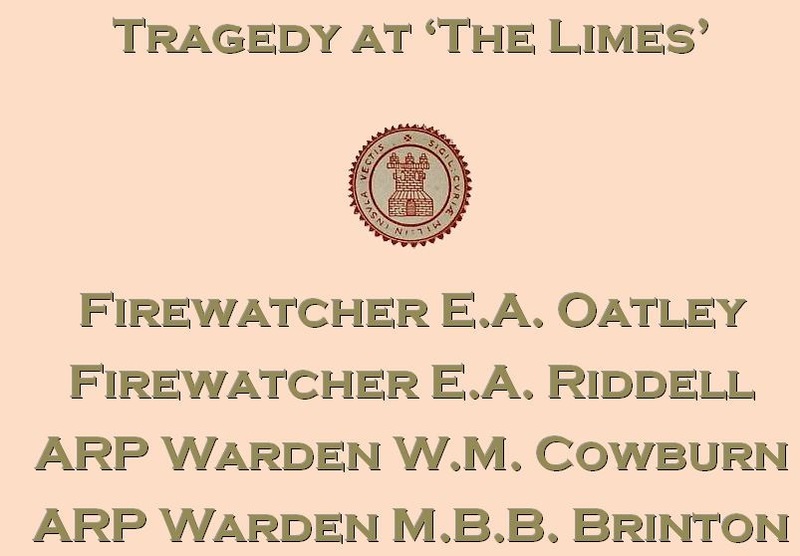 Rest in peace Firewatcher Everett Arthur Oatley, Firewatcher Edward Arthur Riddell, A.R.P. Warden William Marchant Cowburn and A.R.P. Warden Bernard Brooke Montague Brinton. Two weeks after the tragedy at The Limes, Captain H.C. Fowler of the A.R.P. was addressing members of Sandown's Rotary Club and made what was received as a disparaging remark concerning the conduct of Wardens Brinton and Cowburn when referencing the perils of non-conformance with regulations and procedures. With the heat of a mobilised and committed society and its organisations on his back he turned to the County Press who published their view of his response; He said that under a strict interpretation of the regulations it was a moot point whether under such circumstances men would be regarded as deserving as censure or should be remembered as heroes. He said that he believed every Englishman would agree they acted as heroes.